HANGING POT HOLDER home decor, jewelry, decor, decorations, electronics, fountains, floor mats, art glass, vases, garden essentials, fireplace screens. 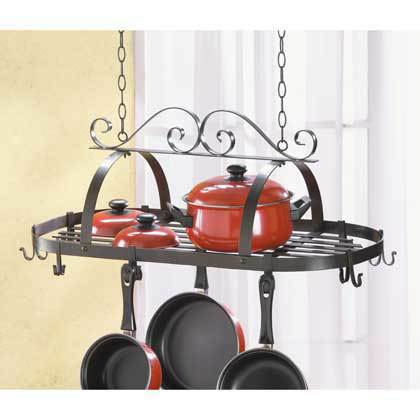 An intricate swirl design makes this wrought iron hanging pot holder with 10 hooks a useful work of art for the kitchen. Material(s): WROUGHT IRON. Weight 10 pounds. Dimensions 31.3" x 15.9" x 11.9".